Abdel Rahman El Bacha - performing Petrushka suite (2/2) - by Igor Stravinsky. ALISON BALSOM - performing Hummel Trumpet Concertos - by Joseph Haydn. ANDRÉ RIEU - performing The Emperor Waltz, opus 437. - by Johann Strauss. ANDREA BOCELLI - performing VIVO POR ELLA. Andrei Gavrilov - performing Elegie, es-moll, opus 3, No. 1 - by Sergei Rachmaninoff. ANDRÉS SEGOVIA - performing Bach. Andrew von Oeyen - performing 24 Preludes, Opus 28 - by Frédéric Chopin. ANNA NETREBKO - performing O mio babbino caro - by Giacomo Puccini. ANNE-SOPHIE MUTTER - performing Violin Concerto no. 1 III, Presto - by W. A. Mozart. ARTHUR RUBINSTEIN - performing Moonlight Sonata - by Ludwig van Beethoven. Benedictine Monks of the Abbey of St. Maurice & St. Maur, Clervaux, Luxembourg - performing DIES IRAE, DIES ILLA - by Thomas of Celano. BENIAMINO GIGLI - performing MAMMA. Bertrand Chamayou - performing Felix Mendelssohn Bartholdy. BIRGIT NILSSON - performing Brunnhilde's Immolation Scene (end) - by Richard Wagner. Boris Berezovsky - performing Piano Concerto No. 2 2 - 1. movement, Moderato - by Sergei Rachmaninoff . CAMILLA WILLIAMS - performing BEAU SOIR - by Claude Debussy. CECILIA BARTOLI - performing Agitata da due venti - by Antonio Vivaldi. Claudio Arrau - performing "Moonlight Sonata", Piano Sonata No. 14 in C sharp minor, Opus 27, No. 2 - by Ludwig van Beethoven. DANIELLE DE NIESE - performing HANDEL ARIAS. DAVID FRAY - performing Piano Concertos Nos. 22, 25 - by W. A. Mozart. DMITRI SHOSTAKOVICH - performing Waltz 2 Russian Waltz. Elisabeth Schwarzkopf - performing Seligkeit - by Franz Schubert. ENRICO CARUSO - performing O SOLE MIO - lyrics were written by Giovanni Capurro, and the melody was composed by Eduardo di Capua. ERWIN SCHROTT - performing Aprite un po' quegli occhi - Nozze di Figaro - by W. A. Mozart. EVGENY KISSIN - performing La Campanella - by Franz Liszt. GIUSEPPE DI STEFANO - performing NESSUN DORMA (Turandot) - by Giacomo Puccini. GLENN GOULD - performing J. S. BACH. GRIGORY SOKOLOV - performing Piano Concerto No. 3, 1/5 - by Sergei Rachmaninov. Ignacy Jan Paderewski - performing Hungarian Rhapsody no. 2 - by Franz Liszt. Igor Levit - performing Sonata No. 2 in A major, Op. 2, No.2 - by Ludwig van Beethoven. ISAAC STERN - performing fiddler on the roof: violin solo. ITZHAK PERLMAN - performing Caprices 01/ 05/ 24 - by Niccolò Paganini. JACQUELINE DU PRÉ - performing Cello Concerto, 1st Movement - by Edward Elgar. JASCHA HEIFETZ - performing Caprice No. 24 - by Paganini. JOAN SUTHERLAND - performing SEMPRE LIBERA (La Traviata) - by Giuseppe Verdi. Joaquín Rodrigo - performing Concierto de Aranjuez. JOSÉ CARRERAS - performing with Sarah Brightman Amigos para Siempre - by Andrew Lloyd Webber. JOSÉ CURA - performing with Sarah Brightman Nessun dorma (Kalaf, Turandot) - by Giacomo Puccini. JOSEPH CALLEJA - performing GRANADA - by Agustín Lara. Joshua Bell - performing Violin Concerto, Opus 35 - by Peter Ilyich Tchaikovsky. JUAN DIEGO FLÓREZ - performing GRANADA - by Agustín Lara. JULES MASSENET - performing ThaÏs: MEDITATION - by Jules Massenet. JUSSI BJØRLING - performing O HOLY NIGHT. KATHLEEN FERRIER - performing LAND OF HOPE AND GLORY - by Edward Elgar. KIM BORG - performing In diesen heil'gen Hallen (Die ZauberflÖte) - by W. A. Mozart. KIRI TE KANAWA - performing EXSULTATE JUBILATE - by W. A. Mozart. LANG LANG - performing Piano Concerto No.1, Opus 11 (1/5) - by Frédéric Chopin. Lauritz Melchior - performing WinterstÜrme - by Richard Wagner. LAWRENCE BROWNLEE - performing L'elisir d'amore. 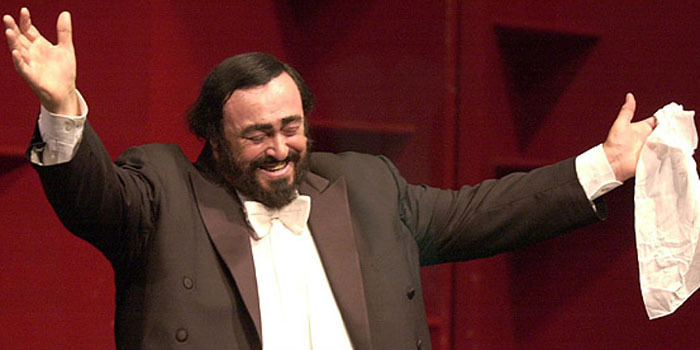 LUCIANO PAVAROTTI - performing NESSUN DORMA (Turandot) - by Giacomo Puccini. MARIA CALLAS - performing MADAME BUTTERFLY - by Giacomo Puccini. MARIO LANZA - performing NESSUN DORMA (Turandot) - by Giacomo Puccini. MARtin FrÖst - performing Clarinet concert in A (KV622) - by W.A. Mozart. Maxim Vengerov - performing Violin Concerto in D minor, Opus 47 - by Jean Sibelius. MONTSERRAT CABALLÉ - performing BARCELONA - with Freddie Mercury. MSTISLAV ROSTROPOVICH - performing Prelude from J. S. Bach's Cello Suite No. 1. NELLIE MELBA - performing Ave Maria (Otello) - by Giuseppe Verdi. PABLO CASALS - performing Suite no. 1 for Cello, part 2 - by J. S. Bach. PAUL POTTS - performing NESSUN DORMA (Turandot) - by Giacomo Puccini. PLACIDO DOMINGO - performing Otello, Dio Mi Potevi - by Giuseppe Verdi. RENÉE FLEMING - performing Casta Diva (Norma) - by Vincenzo Bellini. ROBERTO ALAGNA - performing ROTA (THE GODFATER). ROLANDO VILLAZÓN - performing O SOAVE FANCIULLA - with Anna Netrebko. Sergei Rachmaninoff - performing his Piano Concerto No. 2. STEPHEN HOUGH - performing 3rd, 3rd Movement, Part 1 - by Sergei Rachmaninov. THOMAS HAMPSON - performing Largo al factotum - by Gioachino A. Rossini. VAN CLIBURN - performing Piano Concerto No.1 Movement I-1 - by Pyotr Tchaikovsky. VLADIMIR ASHKENAZY - performing Etude opus 10, part 1 - by Frédéric Chopin. VLADIMIR HOROWITZ - performing Ballade 1 - by Frédéric Chopin. YEHUDI MENUHIN - performing violin concerto - by Felix Mendelssohn Bartholdy. YO-YO MA - performing Cello Suite No. 1 - by J. S. Bach.